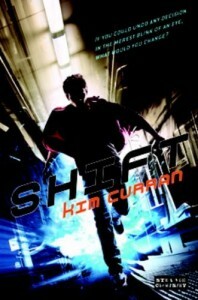 Shift is the story of Scott Tyler, a British teenager who accidentally discovers that he has the power to “shift” between possible realities by changing his past decisions. Along with this discovery comes his entry into a secret world of shifters and a dawning understanding of the terrible powers at play in a world where reality can be changed at will. One on side there is a clandestine government organization called ARES that focuses on training young shifters to use their powers for good, and on the other there is a rebel faction of shifters called the SLF, who believe that shifters should be allowed to use their powers without regulation. Scott’s first contact with the world of shifters, Aubrey Jones, is also, conveniently enough, the girl of his dreams. Aubrey is a pixieish blonde with a chip on her shoulder and conflicted loyalties between ARES, who took her away from her family, and SLF, who seem bent on anarchy and destruction for the sake of it. At first it seems like the book might be about a clash between ARES and SLF, but then we meet the true villain, a morbidly fat man wants to eat Scott’s brains. The villain, Benjo, is easily most original thing Shift has going for it. However, he is so vile and over-the-top that he seems slightly out of place in the story. I actually would have liked the author to delve more deeply into the darkness that might result from people with the power to reset their decisions controlling the world. As it was, the book felt like it flipped back and forth between a fairly by-the-numbers secret world adventure and a squick-inducing serial killer tale. I did also appreciate that the book retained its inherent Britishness, using uniquely British phrasings and colloquialisms that seemed slightly exotic to this American reader. I suppose it’s possible that when the book is eventually published in America, that regional flavor will be stripped out, but I certainly hope not. However, my main problem with Shift is that the underground world of the shifters never seems particularly exciting. The scenes in the school for shifters feel fairly dull and a bit cliché when compared to other similar entries in the genre. In fact, the author ends up quickly summarizing Scott’s time at school after a few scenes, and promotes him to junior agent status as if impatient to get past all that training. The end results is that we never really understand why Scott feels an allegiance to ARES, and it seems like he only really dislikes SLF because they’re the snotty popular rebels. Also, after one of Scott’s early shifts goes terribly wrong, he never really experiences any further consequences from his new-found shifting ability. Although he uses his ability to save himself from death at one point, it never feels like we get to see him exploring his shifting powers. Additionally, the author establishes early on that shifters can only control conscious decisions, so whenever there is a passage where Scott agonizes over a decision, it openly telegraphs that he will need to shift a few pages later, which immediately lowers the stakes. The only real stakes that come into play are when the villain, Benjo, lumbers onto the scene, simply because he is so outrageous that it feels like anything could happen when he is around. Overall, Shift is a bit of mixed bag. The storyline follows familiar contours, as a “normal” kid discovers that he is actually very special and then proceeds to save the day. The cast of supporting characters are all fairly two-dimensional, and several characters established early on barely get more than a few lines before being shuffled off-stage for the rest of the book. Although the villain is a uniquely twisted touch in an otherwise familiar-feeling story, he never completely meshes with the rest of book around him, and the end result is a story that only hints at something darker and more compelling.